Ublox Supersense GPS Maintain Time/Locations. 6A Solar Charger with Low Battery Cut Out. Power Manage switched DC Output. The GSM020 is a low cost wireless GSM/GPRS Real Time Remote Weather STation. User selectable rain gauge tip level can be easily program to match the tipping bucket (0.1mm, 0.2mm, 0.5mm etc) . Another 2 Weather sensors such as wind speed and wind direction can be added to the Rain Gauge. The unit can be use for simple SMS logging or GPRS Logging whereas total rainfall for the day can be send off per day. For RainFall a simple low cost SMS Logger is provided to log rainGauge and export the data to Excel Format for user analysis of Rain Fall or the RainFall graph and data can be view on the PC at request. 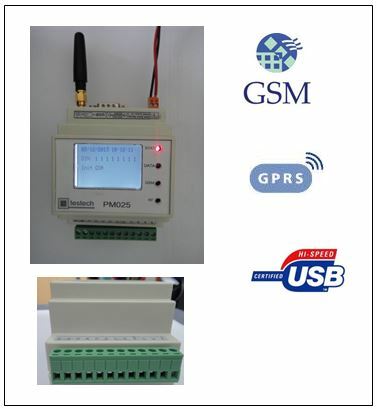 The PM020RG Wireless Telemetry Datalogger as controller which has a built in CE/FCC Approved Quad Band Industrial Class Robust GSM/GPRS Module. These Analog Input can be use for water and wastewater/sewer qualities measurement, continious waterLevel Measurement, and datalog and send SMS alert or upload data wirelesslessly via GPRS. Built in 1Mbit Datalogger Memories in semiconductor flash memory allowing 3 months to 6 months of logging backup while the data is send to the Central Monitoring PC. 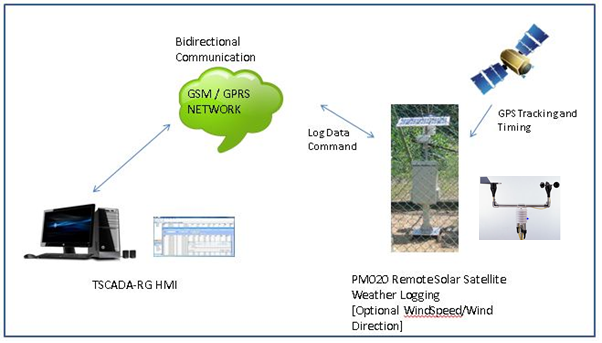 The PM020RG can be remotely configure from the Central Monitoring PC software for example to change the logging interval, change phone numbers, alarm limits etc. The GSM020 is very easy to setup in the field as the entire systems has been pre-setup and wired. Simply installed on the ground, switch on and the unit will start operating and send data to the Central Monitoring Server. Tough Metal WeatherProof Enclosure with Waterproof and cable gland, robust cabling.